A wooden planter can be a great addition to your garden. But there are so many options available on the planter market. What exactly should you be looking for? From shapes to materials, we're here to explain all your choices, so you can get the right planter for your property. There are a few reasons that you might want to consider getting a wooden planter. A planter can be great because it keeps soil contained. If you have a dog that likes digging, or small children, planters can help keep your garden neat and tidy. A planter can also be a good idea if you or someone in your family has mobility issues. Because planters can be raised, less bending is needed to tend to flowers and plants. And then, of course, there's aesthetics. Many people choose to buy wooden planters simply because they look beautiful. 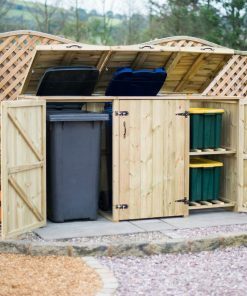 They're convenient options too, since you won't need to dig up your garden and can just fill them with the kind of soil you need (a plus if you're renting your property). The Box: The simplest and most traditional planters are boxes. Usually these are square or rectangular, meaning they fit well into most gardens and corners. 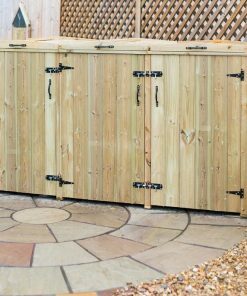 Occasionally box planters can be found in octagonal or hexagonal shapes as well, though these can be harder to place properly. Box planters are sturdy and readily available, meaning they're a common choice. The Trough: A trough planter's design is based around an animal feeder, and usually has supports or legs to hold it up off the ground. A trough is a good idea if you're looking for something higher (if you have mobility issues, for example). However, they're not quite as sturdy as boxes, since they're off the ground, and need to be in more sheltered areas. Depth can also be a problem with troughs, so you'll need to make sure that your trough is deep enough for the roots of the plants you wish to grow. The Wishing Well: Wishing well planters are more of a niche product, though they can look fantastic in the right garden. They're designed to look like a well, with the plants going in the centre, and a small roof, and often have seating around the outside edge. These come in full wells or half wells (semi circular, can be placed against a wall). Since these are essentially box planters they're also sturdy. However, they can be pricey, and are more difficult to find on shelves. The Tree Seat: A tree seat wooden planter is designed to fit around the base of a tree. These planters are very attractive, and can be space savers, since they use the often un-utilised area under a tree. They're sturdy, and relatively easy to find, but fitting them can be tough. It's important that you carefully measure the diameter of the tree you wish to use before buying, and be aware that it's unlikely that you're going to find a perfect fit. The Tiered Planter: Finally, tiered planters are basically a collection of different sized box planters arranged on top of each other. These are sturdy and easy to find, plus they give an attractive effect. They're also space savers, since you can fit more plants on multiple levels in one area. What Kind of Wood Am I Looking For? Many different kinds of woods are used in planters, even reclaimed pallets or packing cases. In general, as long as the wood has been appropriately treated and shows no signs of softness or crumbling, it doesn't really matter what kind of timber you go for. Redwood, cedar, cypress and teak are the most commonly used natural woods. All of these are hard woods, and have natural preservatives that should keep them looking great. You will still need to treat the wood once a year or so though, to keep away fungus and mould. Pine is another popular choice, since it's relatively cheap. There's nothing wrong with pressure treated pine planters, and they can look very beautiful. However, you should be aware that pine is much softer than the natural woods mentioned above, and is more vulnerable to nicks, gouges, and scratches. If hard wearing and long lasting is important to you, then you might be better off spending a little more on a natural wood planter. There are a few things that you should keep an eye out for when shopping for wooden planters. Firstly, ensure that you have appropriate depth. For bottomless box planters, this isn't a large issue, since plants can simply grow down into the ground beneath. But for planters with bottoms you'll need to make sure that the plants you choose have enough room to grow their whole root length. Do make sure that you check build quality, ensuring that joints are tight and the structure is sound. If you're buying a self-assembly planter ensure that you tighten screw appropriately and use good quality hardware. And when placing your planter, make sure that ground is level, or risk having your planter collapse! Ground that gets particularly damp is not really suitable for planters, since standing water will make wood rot. And if you live in a windy area, or your garden isn't very sheltered, you may wish to choose a planter that has anchoring options, so you can dig them into the ground, giving you more stability. Wooden planters are a great addition to a garden. Choose carefully and you should get a piece of garden furniture that not only looks fantastic, but that also lasts you for years. Why Buy a Log Store?